WASHINGTON, D.C. -- Gallup's U.S. Economic Confidence Index improved markedly last week, rising five points to -7 for the week ending Jan. 17. The current score is the highest since June. The results are based on Gallup Daily tracking interviews conducted Jan. 11-17. President Barack Obama on Jan. 12 delivered his State of the Union address, during which he made a strong case that the U.S. economy has improved. Many Americans appear to have heard his message, although a closer look at the data reveals that the improvement in economic confidence since the State of the Union took place only among Democrats, with no change in Republicans' confidence. The latest weekly index reading marks a break from more than six months of fairly stable scores, with Gallup's index figures consistently between -10 and -17 since early July. The index remains higher than it has been for most of the time since 2008, but below the positive readings of +1 to +5 recorded about a year ago. 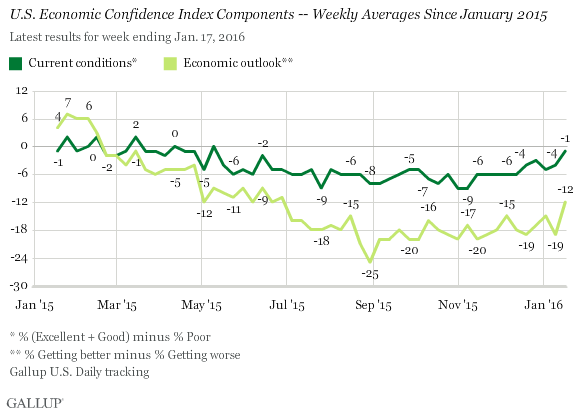 Gallup's Economic Confidence Index is the average of two components: how Americans rate current economic conditions and whether they feel the economy is getting better or getting worse. The index has a theoretical maximum of +100 if all U.S. adults say the economy is doing well and getting better, and it has a theoretical minimum of -100 if all U.S. adults say the economy is doing poorly and getting worse. For the week ending Jan. 17, 28% of adults said the current economy is "excellent" or "good," while 29% said it is "poor." This resulted in a current conditions score of -1 -- up three points from the previous week and the highest score for the current conditions component since early May 2015. Meanwhile, the economic outlook score was up seven points over the previous week and reached its highest since June 2015. At -12, this score is the result of 42% of Americans saying the economy is "getting better" and 54% saying it is "getting worse." U.S. adults were more chipper about the national economy last week than they have been in some time, coinciding with Obama's upbeat State of the Union speech. They are now about equally as likely to have a positive view of the current health of the economy as they are a negative one, and their outlook for the economy's direction remains negative but less so than it has been in recent months. The changes in the U.S. economy are producing mixed results of late. These could lend credence to Obama's assertion that the economy is improving, as well as to GOP presidential candidates' claims that it's in dire shape. Given the strong link between partisanship and economic confidence, which of these competing messages Americans believe largely depends on which leader is delivering that message. Results for this Gallup poll are based on telephone interviews conducted Jan. 11-17, 2016, on the Gallup U.S. Daily survey, with a random sample of 3,533 adults, aged 18 and older, living in all 50 U.S. states and the District of Columbia. For results based on the total sample of national adults, the margin of sampling error is ±2 percentage points at the 95% confidence level. All reported margins of sampling error include computed design effects for weighting. 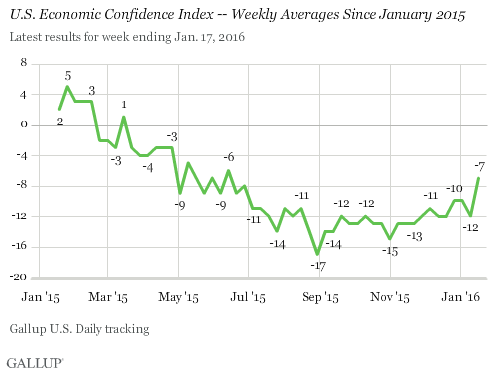 Gallup's U.S. Economic Confidence Index averaged -12 for the first full week of the new year. This is consistent with recent averages and within the range Gallup has measured since September.